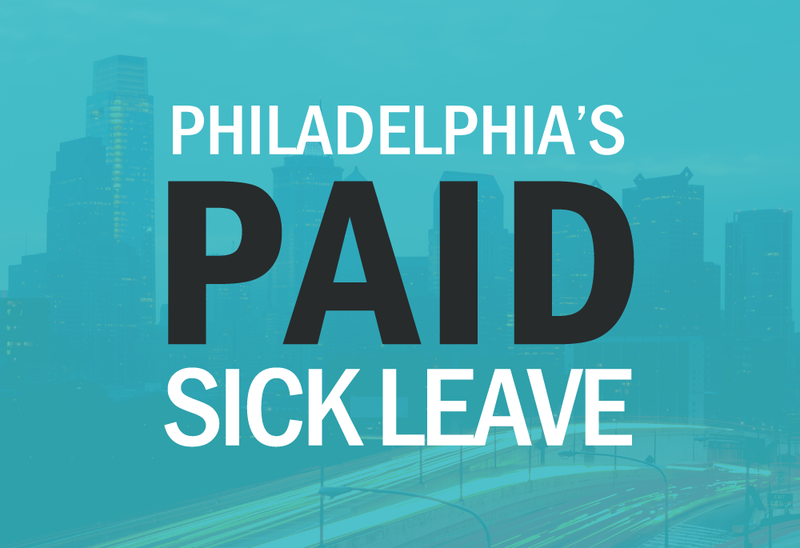 Let’s set the scene for why large and small business owners should be grateful for the recently passed ordinance regarding paid sick leave in Philadelphia. It’s that time of year again, and one of your employees walks into the building with a drippy nose and a nasty cough, looking miserable. Though you suggest he or she take the day off to recover and prevent everyone else from getting sick, your employee says he or she can’t afford to miss a day of work. Sure enough, almost everyone in your office is sick before the week is out, and now you’ve got a situation on your hands. Whether your small business had a paid sick leave policy already or was reluctant to implement one in case your employees took advantage of it for other reasons, most employers established within the city must adhere to the rules regarding paid sick leave in Philadelphia. This new ordinance, the Promoting Healthy Families and Workplaces Ordinance, goes into effect on May 13, 2015, and makes Philadelphia one of the 17 cities across the nation that have enacted such an ordinance, following cities in New Jersey, California, Connecticut, and Massachusetts. According to the new ordinance, employers with more than 10 employees (in addition to franchises located in Philadelphia regardless of the number of employees) must offer one hour of paid sick leave for every 40 hours, including overtime, an employee works. This includes part-time, full-time, and temporarily employed employees so long as they work at least 40 hours in a year at your small business. If you think that you’ll be providing paid sick leave out the wazoo, you might be happy to know that an employee can accrue only 40 hours of paid sick leave in a single year, though it does carry over to the following year if the employee has not used the hours. As an employer, you can still limit the paid sick leave your employees use to 40 hours in a year, even if they have more accrued. You know what that all means for your small business? Your employees no longer have an excuse to come to work while sick and contagious, which saves you and your other employees from the uncomfortable illnesses, effectively promoting a healthier workplace. Though the ordinance goes into effect on May 13, 2015, and most employees will begin to accrue paid sick leave at that time, the effective date of use depends on the length of time an employee has been on staff. Before an employee can use paid sick leave, he or she must have worked at your small business for at least 90 days, though he or she may accrue paid sick leave during those three months. Before the paid sick leave ordinance goes into effect, you, as an employer, must display the appropriate posters to give your employees the information they need. Also consider sending a notification to each employee to ensure that you are not liable for not properly informing them. Failing to post information and notify employees results in a $100 fine per infraction. If you were to withhold paid sick leave for employees in Philadelphia, you would have to pay the amount you would have paid for the sick leave, not to exceed $2,000, in addition to lawyers’ fees. In addition, if any of the above cases apply to a family member of your employee, your employee is entitled to his or her paid sick leave then too. In the event that an employee of your small business takes more than two consecutive days of paid sick leave, you may request reasonable documentation from a health care provider or another official, though you cannot inquire directly into the nature of the illness or details of the violence, if applicable. This prevents employees from taking paid sick leave for an unwarranted cause. Need some help getting set up for paid sick leave accruals? Let us take care of this headache for you. Abacus Payroll’s system allows you to accrue and monitor all types of leave, cheaply and easily. Call the Abacus Payroll team today at (856) 667-6225 and get ready for this new Ordinance.